The phenomenal New Scientist series! Over 2,500,000 copies sold! - What is earwax for? - When is the moon blue? - Do doctors live longer? Informative, hilarious, sometimes unsettling and always unexpected, the questions and answers from New Scientist readers in the magazine's popular "Last Word" column are endlessly fascinating. 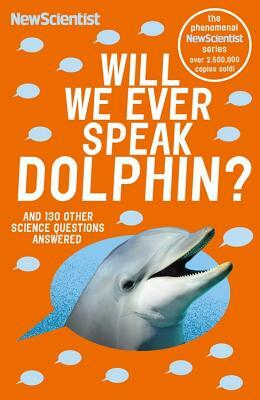 Will We Ever Speak Dolphin? brings the best of the bunch together in another witty, weird and wise compendium that's irresistible for 'Last Word' fans and new readers alike. If you've ever wanted to know why you can't hear shouting underwater, whether ants get scared of humans towering over them, how butterflies know where they're heading, or whether there really is a difference between martinis shaken or stirred, New Scientist has all the weird and witty answers. Since the first magazine was published in 1956, New Scientist has established a world-beating reputation for exploring and uncovering the latest developments and discoveries in science and technology, placing them in context and exploring what they mean for the future. Each week through a variety of different channels,including print, online, social media and more, New Scientist reaches over four million highly engaged readers - over a million readers for the print magazine alone.